Brandon Terry (right), a recent Purdue postdoctoral research associate, and Chris Stoker, an Indiana University alumnus, burn samples of the solid rocket fuel propellant invented by Terry in the Maurice J. Zucrow Laboratories. Boilermaker blasts off in a rocket fuel startup Discovery of a high-performance, environmentally clean, solid rocket propellant takes off from Purdue's Zucrow Labs. Discovery of a high-performance, environmentally clean, solid rocket propellant takes off from Purdue's Zucrow Labs. As a rocket scientist, Brandon Terry (PhD ’15) is on a decidedly fast track. In about five years, Terry earned a master’s degree and PhD in aeronautics and astronautics concurrently and worked as a postdoctoral researcher in Purdue’s historic Maurice J. Zucrow Laboratories. All to great purpose. While a student at Purdue, Terry made a breakthrough discovery of an environmentally clean, high-performing, solid rocket fuel. In 2016, Terry and Chris Stoker, an Indiana University alumnus, founded Adranos Energetics LLC to develop the technology. Terry’s mentors included internationally recognized experts. He worked alongside Steven Son, a professor of mechanical engineering with a courtesy appointment in aeronautics and astronautics, and I. Emre Gunduz, a research assistant professor of mechanical engineering. Terry’s explorations into energetic materials also were helped by a National Defense Science and Engineering Graduate Fellowship and funding from the Air Force Office of Scientific Research. His research quest: to make significant discoveries in solid propellant technology — which has not significantly changed since the 1950s and 1960s. About a year before completing his PhD, Terry found himself running through thousands of computer simulations to verify a surprising lab discovery — that he first thought to be a mistake. Terry's thermochemical calculations showed that propellant with aluminum-lithium in place of the usual aluminum fuel could dramatically reduce the hydrochloric acid (HCI) produced (because lithium chloride salt is formed instead of HCl) as well as predict a higher specific impulse. In practicing good science, curiosity is tempered by a healthy cautiousness. “Our group is always looking for interesting discoveries or new ways to do things,” Son says. “Sometimes ideas have been considered before and discarded with good reasons. It’s important to sort that out early to avoid repeated dead ends that have already been explored.” Thousands of simulations later, along with significant physical experiments, Terry, Son and Gunduz published their results. Brandon Terry, PhD, founder of Adranos Energetics. As Stoker helps convey the message and raise capital, Terry offers enthusiastic analogies to explain his research process. “It’s a lot like baking a cake,” he says. “Solid propellants are basically three ingredients — two dry powders and a liquid to mix it all together.” Typical ingredients for rocket fuel are ammonium perchlorate, a solid oxidizer, and powdered aluminum for the fuel, Terry explains. Metal is used because it burns hotter than carbon, providing better performance. In fact, aluminum has been the additive of choice since the beginning of the space program. Son says there is good evidence for potential success. 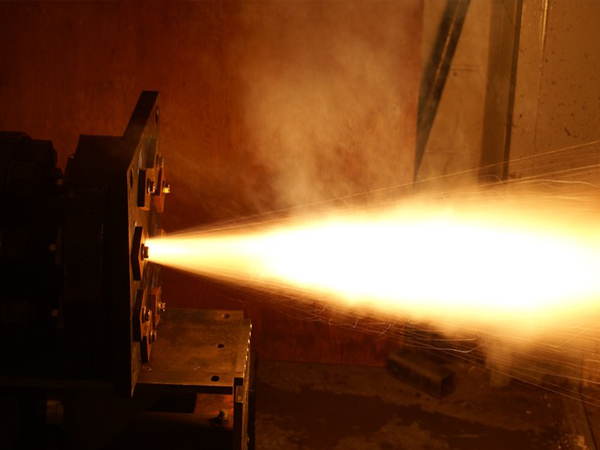 “If proven fully in rocket motors, this will be a significant milestone in the development of solid fuel rocket motors and will save millions of dollars in launch-site corrosion while improving payload and range.” Furthermore, as a safety benefit, the new propellant could mitigate the violence of a slow cook off situation, which could cause something to auto-ignite. 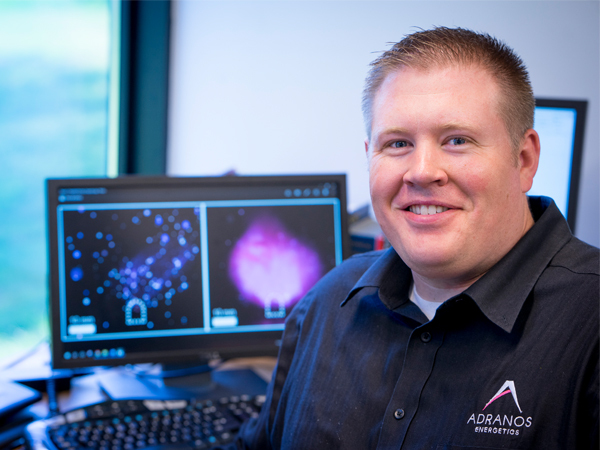 With $150,000 in current funding from the Department of Defense and an application submitted for an additional $5 million, Adranos Energetics is on a roll. 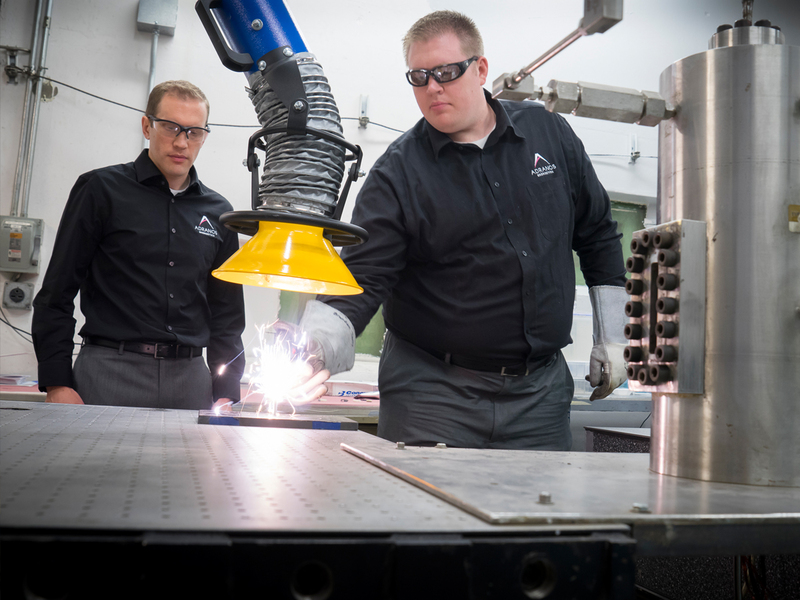 To continue developing the new technology, Terry recently partnered with Utah-based AeroTech Consumer Aerospace, a division of RCS Rocket Motor Components Inc. Testing the solid fuel in a rocket motor. Living and breathing Purdue’s entrepreneurial atmosphere, Terry and Stoker have won several university-based competitions. At Purdue, Adranos Energetics won the Gold Division of the 29th annual Burton D. Morgan Business Plan Competition, resulting in $30,000 in funding. The company also placed first in competitions at the University of Oregon and the University of Nebraska, receiving $25,000 and $10,000, respectively. Additionally, the startup received early funding from the Purdue Research Foundation and the Elevate Purdue Foundry Fund. Adranos Energetics is based in Indiana, where Stoker is holding down the fort. Meanwhile, Terry is in Utah, to be near AeroTech Consumer Aerospace, where he plans to scale up his company’s technology from the lab. The partnership with AeroTech is invaluable, Terry says, given its testing capabilities and decades of industry experience. “Cedar City, Utah, also has below 30 percent humidity throughout most of the year, which offers favorable conditions for mixing propellants,” Terry says. Beyond fueling the future of space exploration and munitions, Terry hopes the startup will become a robust place for scientific inquiry. “One thing really lacking in the energetic materials community is research and development outside of academia,” Terry says. “You have very interesting and publishable ideas going on within academia, but it’s like a think tank. The ideas are not really fieldable.” Fortunately for the industry, Terry’s new solid rocket propellant is an exception. Named for an early Greek god of fire, Adranos Energetics is prepared to power more great ideas — just waiting to take off.